Yakuza Kiwami 2 coming to PC on May 9th, free Clan Creator Bundle DLC for pre-purchasing. After the ESRB leaking it’s rating and SEGA themselves teasing it on Steam, SEGA has officially revealed that Yakuza Kiwami 2 will arrive on PC in May 9th, for the asking price of $29.99. The game is available for pre-purchase on it’s Steam page, with the promise of unlocked framerates, 4K support, customizable controls, and extensive graphics options. In addition, for those that pre-order Yakuza Kiwami 2, they will receive the Clan Creator Bundle for free, which contains exclusive weapons, outfits, items, and rare Leader Cards. Yakuza Kiwami 2 on PC is also notable for technically having a Virtual-On game appear on PC for the first time, and also having the new “Dragon Engine” introduced in Yakuza 6 be utilized on PC for the first time. 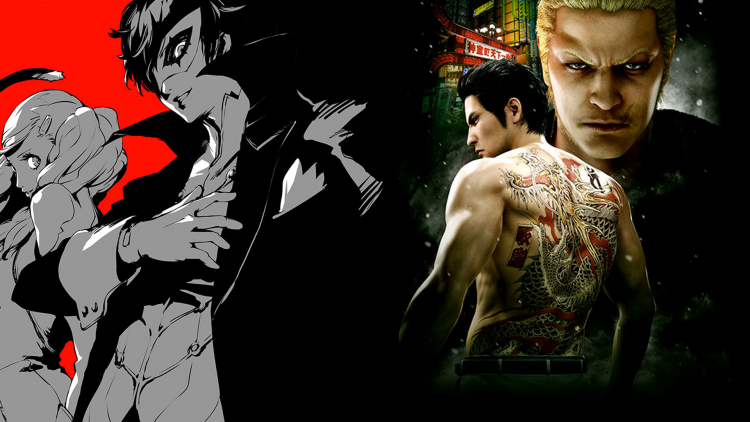 So if you have the spare money, join in on one of the finest games in the Yakuza series this May. Last month we shared the news that the ESRB had rated Yakuza Kiwami 2 for PC, and now it seems SEGA is ramping up their marketing for a reveal of the release. 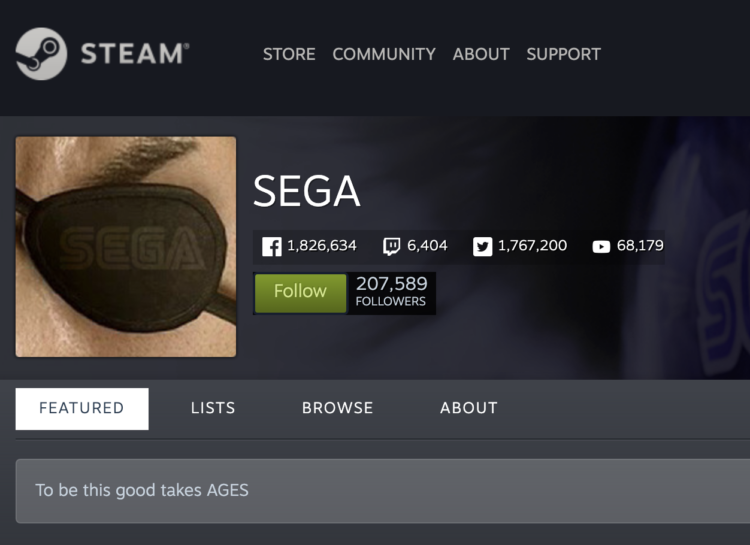 The official SEGA Steam account has updated their profile picture to Goro Majima’s eyepatch, which is right in line with past PC reveals by the company. As discussed on SEGA News Bits Extra, we think Yakuza Kiwami 2 coming to PC before Yakuza 6 is a wise move as the prequel Yakuza 0 and the first Yakuza Kiwami have previously released to PC. With the next chapter in the story soon to be released on the platform, it sets SEGA up nicely for a release of Yakuza 3-5 for PlayStation 4 and PC in the west, followed by Yakuza 6. We’ll share more as we hear it, but expect Yakuza Kiwami 2 for PC news very very soon. It seems that the ESRB is good at two things: Putting logos in front of boxes and leaking games early. Good for us because now we know Yakuza: Kiwami 2 will be coming to PC very soon considering its already been rated by the ESRB. 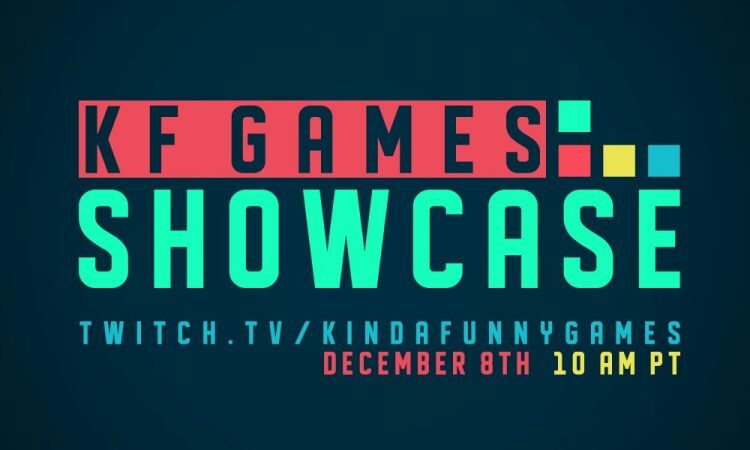 It seems that SEGA has a announcement for the upcoming Kinda Funny Games Showcase that is taking place over on Twitch this upcoming September 10 AM PT, what it could be is just a guess. So what do I think it is? Most likely the announcement for the Dragon Engine Yakuza games coming to PC which includes Yakuza Kiwami 2 and Yakuza 6. I wouldn’t expect a new game announcement or anything, just because Ryu Ga Gotoku Studios announces new games in Japan, not Western shows like Kinda Funny Showcase. It could also be the release dates for Yakuza 3, 4 and 5 in the West, which would make sense since Kinda Funny Games is ran by Greg ‘I love PlayStation’ Miller (not making a sly remark, the man loves PlayStation). It would also be nice to get a Western finalized name for Project JUDGE. What are your thoughts? SEGA has just launched its 10.01 gigabyte demo (better than Yakuza 6‘s 36GB demo) for Yakuza: Kiwami 2, which can be downloaded on both America and European PSN stores. The demo lets you play as our baby boy Kazuma Kiryu, where we can explore the city and retrace the steps of The Grand, Goro Majima’s old place and aid people in their daily struggles. So typical Yakuza-ism. The demo also allows you to try play spots such as darts, karaoke, golf and more. SEGA has also put up digital pre-orders for Yakuza: Kiwami 2, if you pre-order early you get to unlock an exclusive PlayStation 4 theme. There is also a ‘Special digital edition’ that is available for a limited time that comes with a special item pack that contains a Demonfire Blade weapon, Hostess Ono Michiyo, Sotaro Komaki R Clan Card, Jo Amon R Clan Card, The Comedian suit outfit, and 1 million yen to spend. You can pick up Yakuza: Kiwami 2 on PlayStation 4 this upcoming August 28! On the fence about buying Yakuza Kiwami 2 (what the hell is wrong with you?) or just can’t wait to play the game? The Yakuza Kiwami 2 demo has landed on the PlayStation Store! Pre-orders have also opened for the digital version on PSN, with an exclusive “Dragons” theme and the “Special Item Pack” which includes: Demonfire Blade weapon, Hostess Ono Michiyo, Sotaro Komaki R Clan Card, Jo Amon R Clan Card, The Comedian Suit Outfit, and 1 Million Yen. Login today and check out the demo and digital pre-order content! SEGA has released another announcement trailer, this one being a bit longer. The first announcement trailer was just over a minute in length, this one is almost two minutes. If you didn’t know, Yakuza Kiwami 2 came out in Japan on December 7, 2017 and we will be getting the game in America and Europe on August 28, 2018. This means that Yakuza Kiwami 2 is the fastest localized version of a Yakuza game ever. Very well done by the translation team! Like always Yakuza Kiwami 2 comes out this August 28, only on PlayStation 4. You can pre-order the steelbook edition now on Amazon. It really does seem that the Yakuza franchise has finally gotten the attention its deserve since the release of Yakuza 0. Now with Yakuza 6 around the corner, SEGA has announced that Yakuza Kiwami 2 will be heading to the West this upcoming August! Considering it is one of my favorite entries to the franchise, I decided to record a little video for you guys talking about the release, what to expect and other nonsense. Are you guys picking up Yakuza Kiwami 2 when it releases? If not, you should! 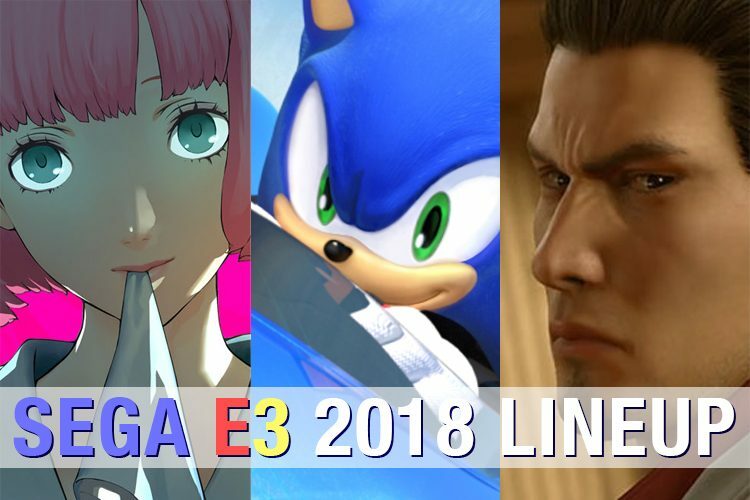 SEGA announced at it’s Essence of of Art Exhibit that the remake of the second installment of the Yakuza series will be making it’s way to the West on August 28th 2018. The turn around from the original Japanese release in December 2017 to the Western release of Yakuza Kiwami 2 in August 2018 will make it the quickest turn around in the franchise’s history since the original release. 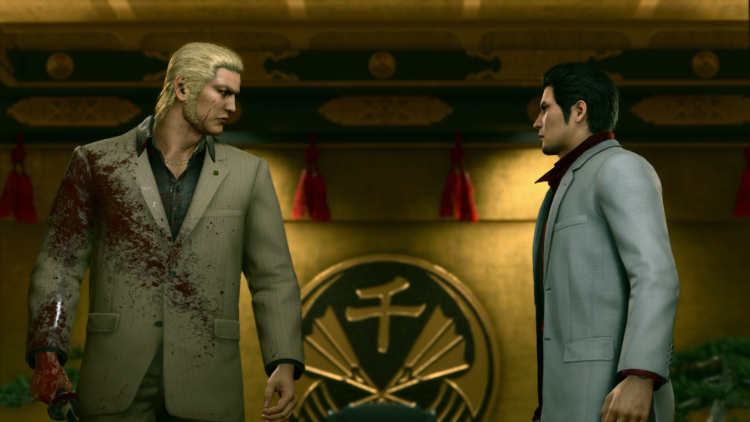 Check out the trailer above and get ready to relive one of the great rivalries of the series, Kazuma Kiryu vs Ryuji Goda. The game will release in two editions: a special Steelbook Edition and a Standard Edition. On this episode of the SEGA News Bits, we say goodbye to 2017 and start discussing what SEGA has in store for 2018. Join us as we discuss all the major releases from SEGA, SEGA related games not published by SEGA and what surprise announcements we think SEGA has for us next year. So sit back, listen in and let us know what SEGA title you are looking forward to the most in 2018!